Arcadia, CA (November 3, 2018)-Cruel Intention and Galilean could not get rid of each other through the stretch of Saturday’s Golden State Juvenile for 2-year-old California-breds at Santa Anita before Cruel Intention prevailed by a neck. This was their first meeting, but is unlikely to be their last. They could easily meet in statebred stakes, or perhaps graded stakes, in coming months. Cruel Intention ($3.60) stalked the early pace and moved alongside early leader Galilean with a quarter-mile remaining. Galilean led by a head with a furlong to go. The two ran as a pair to the final yards before Cruel Intention took a narrow lead nearing the wire, finishing seven furlongs in 1:22.82. Galilean finished 16 lengths clear of third-place finisher Luck’s Royal Flush, a 13-1 chance. Galilean set a solid pace of 22.17 seconds for the opening quarter-mile and 44.90 for a half-mile and ran brilliantly in defeat. I Belong to Becky, the 71-1 longest shot in the field, finished fourth, followed by Listing, Oliver, and Whooping Jay. Cruel Intention was ridden by Evin Roman for absent trainer Bob Baffert, who was at the Breeders’ Cup races at Churchill Downs. Cruel Intention was saddled by Mike Marlow, an assistant to Baffert who directs the famous trainer’s division at Los Alamitos. Marlow had Cruel Intention in his stable until mid-September when the colt by Smiling Tiger was transferred to Baffert at Santa Anita. Cruel Intention won his debut in a maiden special weight race at six furlongs by 5 1/2 lengths on Oct. 13. The win in the Golden State Juvenile was worth $110,000 to the partnership of Jungle Racing, Nexus Racing Club, and Larry Roth’s LNJ Foxwoods. “He ran a really nice race,” Marlow said. “The only time the rider had me a little nervous was when he had a tight hold of him on the backstretch, but not for too long. Sometimes, you can take too much away from them when you take a hold. Cruel Intention was purchased for $200,000 at the Barretts 2-year-olds in-training sale at Del Mar earlier this year. 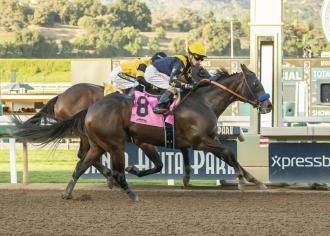 Lakerball Has Easy Time in Pike Place Dancer GRADE 1-WINNER OF $1,295,814 MAJESTIC HARBOR TO HARRIS FARMS!